Identify minor problems to avoid major failures. Extend equipment life—Contaminant levels in fluids dictate when to replace filters. Increase oil drain intervals—The condition of your oil indicates when oil changes are actually necessary. 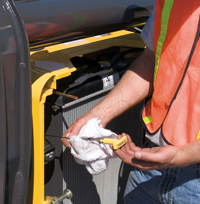 Increase resale value—Oil analysis records prove your equipment has been maintained. What is an oil analysis? Fluids are taken from several areas in your equipment and are analyzed by laboratories to determine levels of contaminants in the various fluids. The level of each contaminant is compared to normal wear rates, so that potential problems with components can be identified before failure. The trends for the contaminant levels in your equipment also provide valuable information on potential problems. Franklin Equipment monitors your oil analyses. We will provide guidance on necessary repairs and filter and oil change intervals, based on the results for your equipment. Manufacturers recommend sampling intervals for each model. Also consider how critical each piece of equipment is to your production in determining sampling frequency. You may want to reduce the hours between sampling periods for equipment operating under more stressful conditions, such as those in a very hot, dirty environment, or machines used for short trips with heavy loads, or those with excessive idle times.